Things get worse. Stealth camping and cascading bus problems. Death Valley broke us a bit. The Big Kahuna was not running quite so smooth as in the before time, and the dust and heat had taken its toll on our bodies as well. 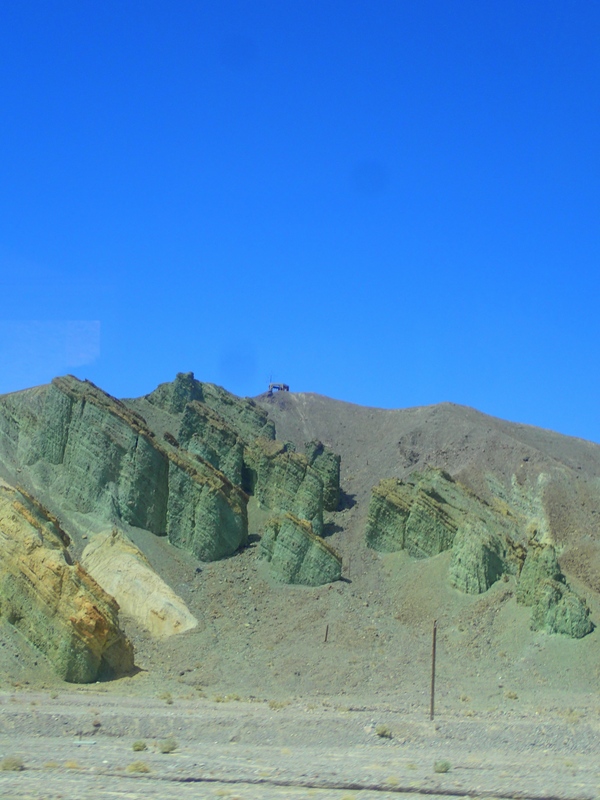 We resolved to move on, driving without rest for hours and even into the dark, which behind the bus wheel I hate, heading towards some point vaguely south of the valley, one that offered us a choice. Loop around northwest to Sequoia National Park? Continue south to Joshua Tree? Southeast to Ventura and the Channel Islands? 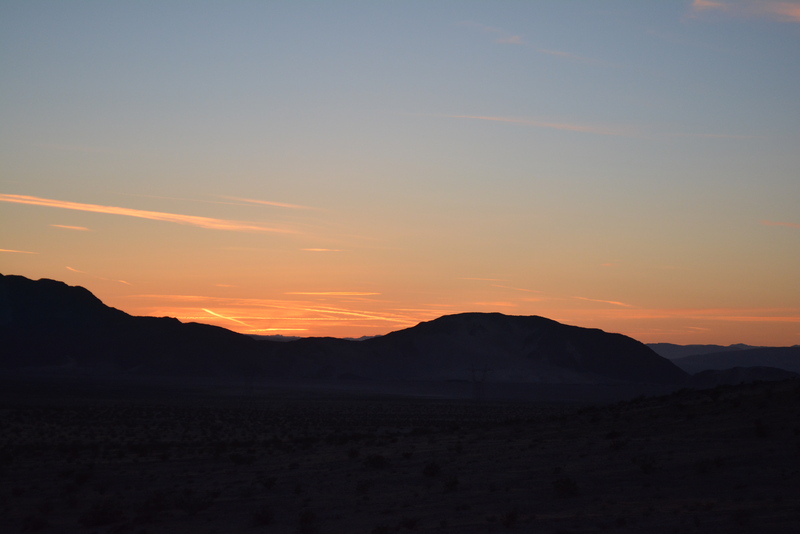 We were thinking the first option, right up until we pulled into a Barstow gas station, light all but gone, trying to get a bearing on a place to stay for the night, and met up with a European couple in a rental RV who had recently come from Sequoia. In between our mutual efforts to find an affordable RV park with an office that was still open (and really KOA? $53 for your campground? Pshaw), we discussed where each of us had been and was heading. They advised strongly against trying to take The Big Kahuna up the entry road into Sequoia National Park, a recommendation that would prove, after further research, to be absolutely accurate. But for tonight, the problem remained: it was dark and we needed a place to stay. The young Europeans, with their no doubt genetically engineered night vision funded by some secretive U.N. collective, elected to continue west towards more reasonably priced areas. I honestly don’t remember what we “decided” because Kahuna vetoed all options by refusing to change gears or do anything other than idle in place. Seriously, even the turn signals would not come on. We shut him down, set up the generator and battery charger, and “consulted” with the young man behind the counter at the gas station currently hosting our big hunk of non-moving metal. He seemed… unconcerned with our predicament or our intention of staying the night right there. OK then. 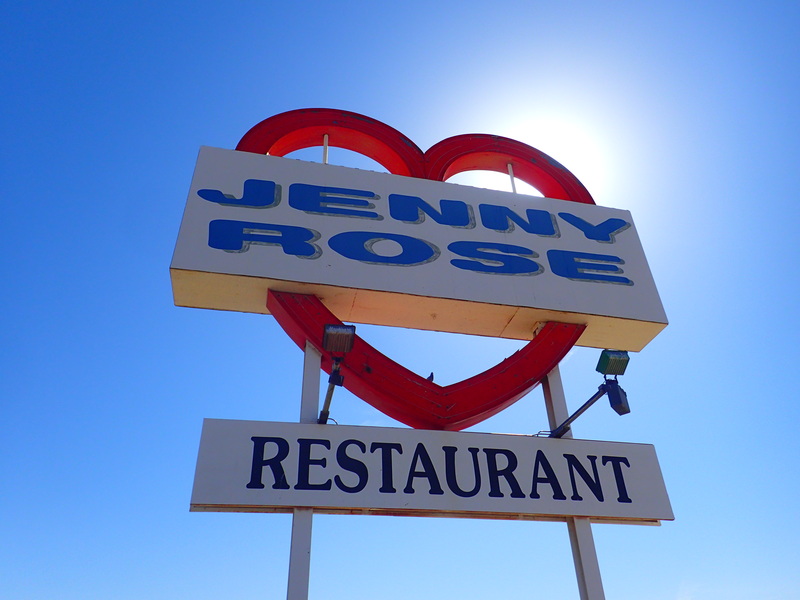 An hour or less of charge did the trick, and we maneuvered ourselves back into the large paved shadowy area adjacent to a restaurant, the Jenny Rose, currently closed for renovations. And so we found ourselves “stealth camping” in an open lot behind a gas station near an I-15 exit. We slept well, and undisturbed. We took the restaurant sign as an, er, sign.